After over three years since its announcement, or 1,182 days, Pokémon Go has finally added the trainer battles as teased in the initial reveal trailer. One of the mainline series' core mechanics has taken a long time to come to the mobile spinoff, despite the mobile game's immense popularity and the fact that it was listed as a bullet point in the game’s original trailer. We got hands on with the newest pillar of Pokémon Go’s gameplay and learned all about how the new battles work. Pokémon Go’s PvP seems like an obvious mechanic based on how important it is to Pokémon in general in the games and, well, basically every other medium. 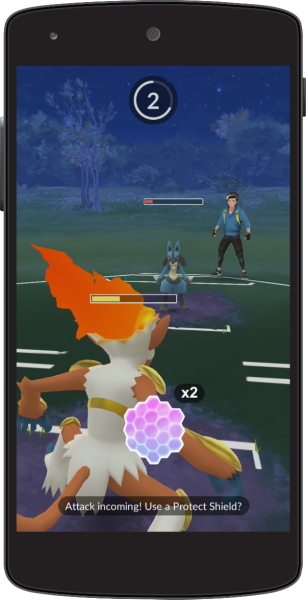 For Niantic, creating player-vs.-player battles meant asking themselves the fundamental question of “What does it mean to be good at Pokémon Go?” While gym battles against the AI have long been a part of the mobile title, that battle system is not necessarily well-suited to competing with other players, which required thinking about what a successful Pokémon Trainer in the Pokémon Go world would look like. At its most basic level, Pokémon Go’s trainer battles still look a lot like its gym and raid battles. You bring a Pokémon into battle, tap the screen until a move charges up, and switch when appropriate. There are a few key differences for specific tuning toward making PvP more doable than the war of attrition that gym and raid battles tend to be. Each trainer only brings in three Pokémon this time to keep battles moving faster in PvP. At that point, you tap like mad to get your Pokémon to charge up their special moves, and then choose to use the move by tapping the button on the screen. When a Pokémon uses their special charged attack, the other Pokémon can choose to use a consumable defense shield that trainers get two of per battle to help blunt the incoming attack a little. 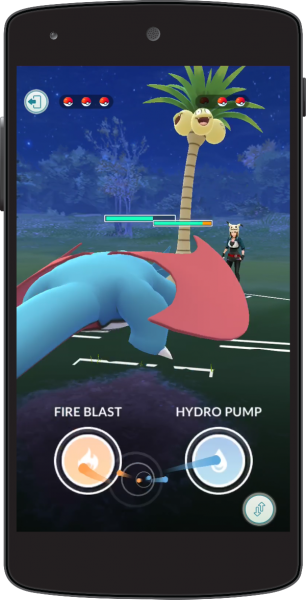 While you can also switch Pokémon in real-time, there is a cooldown once you switch so you and your opponent can’t just keep changing types over and over. Outside of battle, you can use stardust and evolutionary items to teach your Pokémon a second charge move to choose between when fighting. Some Pokémon will learn a stronger new move of the same type, but some will get entirely different types, increasing their versatility. A dragon type that has a dragon charge attack and a fire attack means they can handle both dragons and ice Pokémon that step up to battle. Basically, battling comes down to the team you brought in, your type advantages, which of your Pokémon have second charge moves, your tapping speed, and making the right calls on when to defend. To get into a trainer battle, you physically approach someone playing the game and scan the QR code in their trainer profile. Niantic says they wanted players to have to physically make contact with other players to match the way trainers in the main game lock eyes before challenging each other. You can tell people how great you think shorts are in real life now, but there’s no guarantee that’ll get them to show you their QR code. If you’re Ultra friends with someone, you can battle them online as well. After scanning, you agree on a league in variations of Great, Ultra, and Master. Great limits the battles to Pokémon with CP under 1500, while Ultra ups the limit to 2500, and Master removes the limit altogether. If you just started the game but met someone who has been playing for years and constantly getting stronger Pokémon, you can keep the battle on the ground level. After you agree on a league, Pokémon Go recommends a team for you based on the CP requirements. The recommendations are based on a number of factors, but primarily CP, so your three strongest Pokémon of different types likely get chosen, but you’re free to adjust your team around. For people you meet in public, you might not necessarily know what teams they prefer, but battling people multiple times or friends or other trainers you see during Pokémon Go community days might give you an edge in guessing which Pokémon they’ll bring into battle. Battles have a hard timer of four minutes, but you don’t see the countdown until the last thirty seconds. After time runs out, the game decides a winner based on a number of different factors, including number of Pokémon remaining and their health. 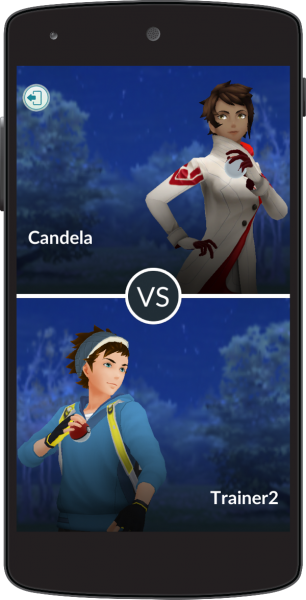 You can also practice against AI trainers by testing your mettle against the team leaders Candela, Blanche, and Spark whenever you want. Be warned, though, they can be incredibly aggressive and charge up moves inhumanly fast. Whether you’re playing against a human or the AI, you get rewards for winning or losing. After the battle, both players are given stardust and the possibility receiving of evolutionary items, including rare ones. The now-retired Ace Trainer badge makes a return for players who win enough battles. 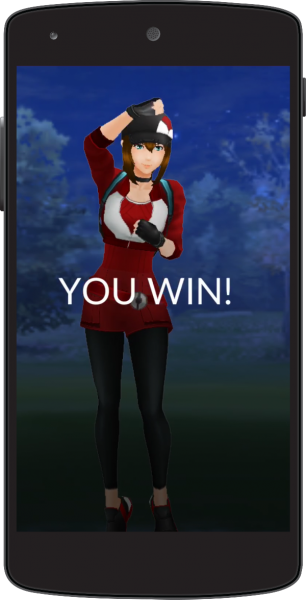 The game keeps track of your wins, but not your losses, so Niantic wants to incentivize everyone to go out there and challenge as many people as possible. Perhaps most interestingly, Niantic has said that Pokémon Go’s battles are not done evolving and that they plan to incorporate more mechanics from the mainline games, but were not forthcoming about what it might be. Perhaps items are one possibility or maybe traits or abilities, it is hard to say. When asked about other possible features, like battles taking place using Augmented Reality or allowing spectating of battles, Niantic said it's still exploring and experimenting with further changes. So, was it worth the wait? It’s going to vary a lot and depend on how often you meet with other people who play Pokémon Go, as the battles don’t really seem conducive to long, strategic sessions. They seem designed for fighting someone and then quickly moving on to the next trainer. As they add more mechanics to the battles, it will hopefully get a lot more interesting and be less dependent on CP, but it is not something that feels like it took three years to design.